Despite all the predictions of Mayan apocalypse, the world will probably not end by Saturday morning. How will the believers cope when life carries on? If they've taken the warnings seriously enough, they will have sold their homes, abandoned earthly civilisation's material trappings and braced themselves for the arrival of a new era. The latest date to herald widespread alarm is 21 December, which marks the conclusion of the 5,125-year "Long Count" Mayan calendar. Media captionFarmer Liu Qiyuan has built seven survival pods in which people can ride out the Apocalypse, if it happens. Panic-buying of candles has been reported in China's Sichuan province. In Russia, where sales of tinned goods and matches have surged, Prime Minister Dmitry Medvedev has urged his countryfolk to remain calm. The 2012 phenomenon is essentially an accounting problem; a misinterpretation of some very ancient book keeping. It is based on the Maya calendar, which counts the days since a date in the mythical past. This count reset after the last creation (on or about 11 August, 3114BC). On 21 December, we will reach that same number of days once again, and many now are concerned that a calendrical reset the following day will mean the end of the world. But it is not even clear that the Maya themselves agreed on this book-keeping issue. Two ancient inscriptions emphasise the importance of the date. But a third focuses on 13 October 4772, the end of an even bigger cycle that cannot happen if a reset occurs in 2012. This more detailed text predicts that, at an even later date, the great king K'inich Janaab' Pakal will return to Palenque to rule. If this Maya prophesy is true, then the world will not end in 2012 or even 4772, no matter how the ancient calendar functioned. End of the world, or a new beginning? Authorities in the French Pyrenees are preparing for an influx of believers to the mountain Pic de Bugarach, where rumours have spread that UFOs will rescue human gatherers. And one doesn't have to belong to a sect to find these predictions compelling. Humankind's ongoing fascination with the apocalypse is evident in mainstream popular culture. Films like 2012, Armageddon and The Day After Tomorrow all packed out multiplexes by depicting threats of global catastrophe. The Left Behind novels about a "post-rapture" world have reportedly sold more than 70 million copies. If precedent is any guide, however, 21 December is likely to prove an anti-climax. Since the dawn of civilisation, humans have often been gripped by certainty that the world was about to end. More recent apocalypses have panned out in much the same way. Followers of Nostradamus braced themselves for the arrival of the "King of Terror" in "1999 and seven months". US television evangelist Pat Robertson forecast that "something like" a nuclear attack would occur in late 2007. The California radio preacher Harold Camping set a date for the end of the world no fewer than six times, settling on 22 October 2011 - a day which, historians may recall, was distinguished by an absence of fire and brimstone. "The vast majority seem to shrug off the failure of prophecy fairly well," he says. Of 75 groups identified by Dawson which predicted the apocalypse, all but six remained intact after catastrophe failed to materialise. Indeed, many have gone on to flourish. Jehovah's Witnesses are viewed as having predicted some form of end several times and yet still have more than seven million followers. "It was a bitter disappointment that fell upon the little flock whose faith had been so strong and whose hope had been so high," wrote follower Ellen White, "but we were surprised that we felt so free in the Lord, and were so strongly sustained by His strength and grace"
When both the apocalypse and the UFO failed to materialise, Festinger found, the leader declared that the small circle of believers had "spread so much light" that God had spared the planet. Her followers responded by proselytising the good news among non-believers in what Festinger saw as a classic case of cognitive dissonance. In a similar exercise, psychiatrist Simon Dein spent time with a small community of Lubavitch Hassidic Jews in Stamford Hill, north London. For years many Lubavitchers had believed their spiritual leader Menachem Mendel Schneerson, known as the rebbe, was the messiah. According to their theology, he would herald the end of civilisation and usher in a new age. Their faith was tested, however, when the rebbe passed away in New York in 1994. "I was there at the time he died," says Dein. "They were crying. They were mourning. There was a great sense of denial - he couldn't die. Would he reveal himself?" But, Dein says, these Lubavitchers did not give up their belief system. Very quickly, they took up the idea he was still alive and could not be seen, or that he would somehow rise from the dead. "There are very heated tensions between those who believe he's alive and those who believe he's dead, but his death doesn't seem to have diminished the number of people in the group," Dein says. According to Dawson, the 200 Lubavitcher families in Stamford Hill had the most crucial trait necessary to keep a group together after a failed apocalypse - a strong sense of community. "If the group itself has been pretty cohesive, it's been free of schism and dissent, they can get through," he says. "In 1988 there was a really big apocalyptic scenario. I was 14 and in my freshman year at high school in Amarillo, Texas," says Jason Boylett, author of Pocket Guide to the Apocalypse. "A former Nasa scientist and mathematician called Edgar Whisenant had predicted the world was going to end in September based on calculations from the Bible. He sent his pamphlets out to hundreds of thousands of churches. My Southern Baptist pastor talked about it from the pulpit. "I spent that summer really pretty scared, because people who had authority our our lives said this is something that might happen in September. I was afraid this was going to be my last summer. When the dates came round I went to bed thinking this is going to be the last time I see my parents. "Afterwards, obviously, I was relieved. But it really disillusioned me. I knew then I couldn't always trust my pastor. "I'm still a practicing Christian and I'm not walking around psychologically wounded. But since then my religious belief has been marked with a lot of questioning, a lot of doubt and a lot of cynicism." "If rationalisation comes quickly, the group can withstand ridicule from outside," he adds. Some leaders, such as Camping on several occasions, simply offer a new date for the apocalypse. Others apologise to their members for getting the scheduling wrong. Tragically, some take more drastic action. The bodies of 39 members of the Heaven's Gate cult were found in 1997. They had taken their own lives in the belief they would reach a UFO following the Hale-Bopp comet. "When you have invested so much in a belief, you have a very strong interest in salvaging something from it," says Philip Jenkins, a historian of religion at Baylor University in Texas. For Jenkins, the appeal of leaders preaching the impending apocalypse down the ages has always been about far more than the specifics of their prophecies. "It's a kind of rejection of the order of the world as it is," he says. "It's to do with imagining something far better. After it becomes apparent that the new order isn't going to come, there are ways of adjusting the message." 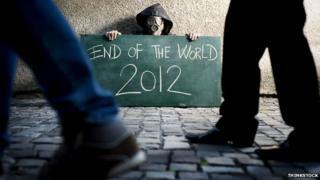 Mayan apocalypse: End of the world, or a new beginning?